Don't let the 0.5% less alcohol by volume fool you, the Night Train is all business when it pulls into the station. All aboard to nowhere - woo wooo! The night train runs only one route: sober to stupid with no roundtrip tickets available, and a strong liklihood of a train wreck along the way. 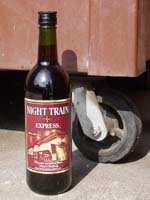 This trainyard favorite is vinted and bottled by E&J Gallo Winery, in in Modesto, CA. Don't bother looking on their web page, because they dare not mention it there. As a clever disguise, the label says that it is made by "Night Train Limited." Some suspect that Night Train is really just Thunderbird with some Kool-Aid-like substance added to try to mask the Clorox flavor. Some of our researchers indicated that it gave them a NyQuil-like drowsiness, and perhaps this is why they put "night" in the name. The picture (above right) shows that the subject that drank Night Train is down for the count, while the Cisco guzzling subject is ready to rock. Guaranteed to tickle your innards.